It's a draft product, so every tournament you'll build a different deck. Even if you try to play the same affiliation multiple times, you'll never get the same deck twice. It's a random booster generator, so every pack you generate will be different. It has cards like Transport Crash Survivor, which allows you to mix and combine whichever skills you want to try to complete the mission. Those are all well and fine, but do you want to make Infinite Diversity become really diverse? The potential is there, now it's time to start demonstrating it. 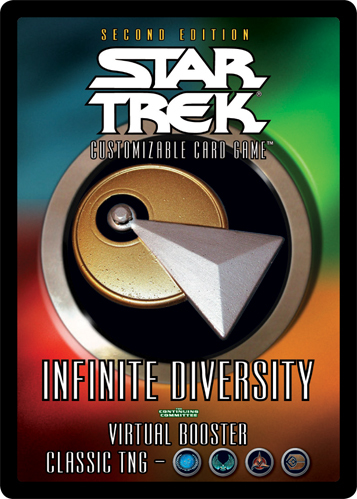 Infinite Diversity has been out for a few weeks now, and there've been a number of release tournaments around the world. You've tried the new draft format, given some feedback on it, and in general it seems people are pleased with the way the draft works. Based on early feedback, we've already made a few changes to make it easier for you. A common complaint was the "production time" that goes into creating the virtual booster packs. You now have the option to print out pack-lists that will allow you to "rebuild" the packs at the end of the tournament for reuse later. It takes some of the diversity out of it (because you've seen the packs before), but once you have the cards back in their "packs" you can shuffle them up and redistribute them, at least. This way, your second tournament will be a lot easier to set-up, because your packs will be all ready for you, still maintaining the pseudo-random distribution of the original packs. And to make it easier for you to store the packs away, you can now print out "wrappers". Just print out the page of wrappers, cut them out, and you can easily store your 9-card pack, with the wrapper in front (folded over to keep the cards contained and hidden), in a penny sleeve for later use. So, what's the next step towards adding more diversity to the draft experience? Options, options, options. If you've tried the Virtual Pack Generator, you've noticed that the "Draft Pack" option is in a drop-down. That's because we plan to gradually add additional options for draft pack themes. Every four to six months we'll take a community poll, and let you decide what pack to add next. Yes, we could just add them all at once... but where's the fun in that? This way it allows for more focused usage of the packs (so players have time to "master" the Classic Next Generation pack, instead of being overwhelmed with options). Borg doesn't really work, because it can't mix with anybody else. Voyager/Equinox don't really work, because they need too many cards to get started. If you use duplicate headquarters (multiple Earth or Mouth of the Wormhole), keep in mind that it will put a limit on the dual-headquarters deck possibilities. If you use headquarters with significant overlap together (such as Bajor and Deep Space 9), it will make a lot more personnel available to both of those headquarters, as they can each utilize personnel flagged for the other. You should generally use between three and five affiliations (and Non-Aligned is assumed). Four affiliations appears to be ideal. And now it's your turn. Let us know your ideas via this thread.